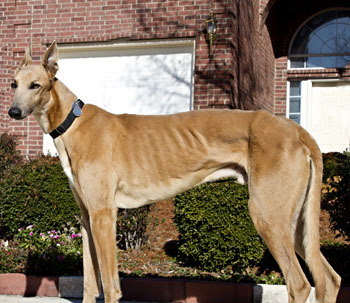 Reed is a 7½-year-old fawn male born in September 2004 who came to GALT from Garland Animal Services where he was turned in as an owner surrender. His registration tattoos are still being researched at this time but his right ear is 94C. Reed is a BIG, healthy boy! 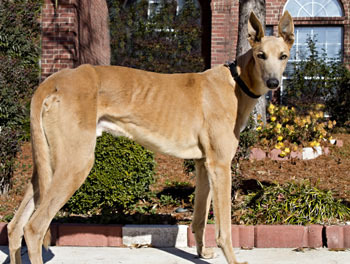 He is very friendly and is living in a home with other greyhounds. Reed is not cat tolerant, and should also not live with tiny dogs. 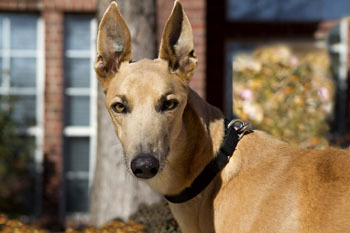 Reed is a playful fellow who likes to shake the occasional toy and loves to romp with his fellow greyhounds. He gets excited about walks, but doesn't pull on his leash. He's quite mannerly in the house too - never counter surfing or getting up on the furniture. His housetraining is impeccable. He lives with a Sheltie in addition to his greyhound foster brothers, but is not tolerant of cats or very tiny small dogs. Reed is a quiet guy - never barking or making a fuss. He's waiting patiently for a family to fall in love with - won't you come give him a chance?